When you hear the word protein, what comes to mind? If you’re like most people, “protein” conjures images of muscles and fitness. But it’s not just people who are avid gym-goers that need more protein than their sedentary counterparts. Older adults need extra protein too (1). Unfortunately, most older adults fail to get enough protein in their diets to ensure healthy aging (1). In turn, this can lead to many unintended consequences including muscle loss, osteoporosis (a disease where bones become weak), falls and fractures. 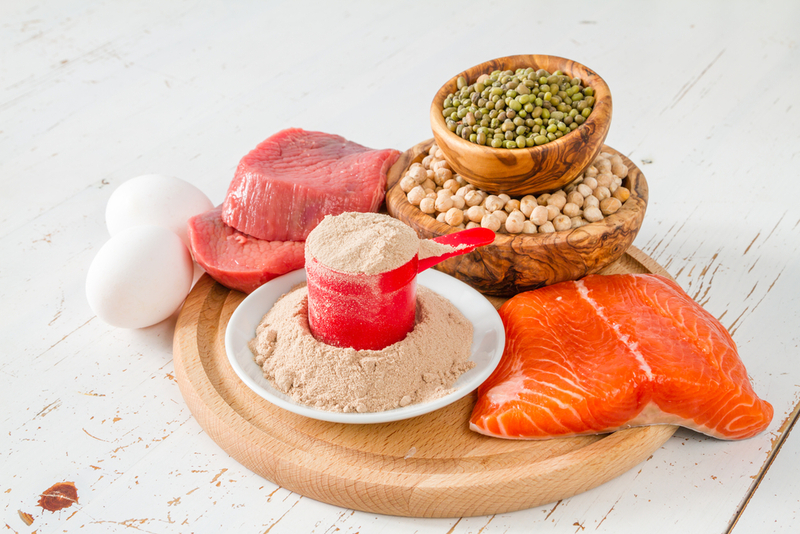 This article explains the importance of protein for healthy aging and how much protein older adults need for optimal health. Protein is made up of amino acids — the building blocks of life. These amino acids are joined by chemical bonds and then folded in different ways to create structures that are important to our body’s functioning. Essential amino acids: our bodies can’t make these so they must be consumed in the food we eat. Conditionally essential amino acids: these are not essential, except in times of stress or illness. Nonessential amino acids: our bodies can make these, even if we do not get them through the food we eat. These amino acids are found in a variety of foods. Protein is essential to life. Therefore, it’s found in almost everything we eat. But some sources are better than others. The best sources of protein are animal products such as meat, poultry, fish, eggs and dairy products (with the exception of butter and sour cream) (2). Protein from animal sources contain all the essential amino acids and are therefore considered complete proteins. Plant products such as grains, grain products, legumes and vegetables also contain protein. The majority of protein from plant sources are considered incomplete proteins because they lack one or more of the essential amino acids needed for human life. Ground sirloin: 24 grams per 3 oz. Tuna: 20 grams per 3 oz. Pork tenderloin: 18 grams per 3 oz. Peanut butter: 8 grams per 2 tbsp. Yogurt: 8 grams per 6 oz. These protein-rich foods contain different nutrients such as vitamins and minerals that others may not have, so it’s best to consume a variety of protein-rich foods — not just one or two. Enzymes: these are proteins that carry out chemical reactions in the body. For example, pepsin is a digestive enzyme that works in the stomach to break down proteins in food. Antibodies: these remove foreign particles, such as viruses to help fight infection and protect the body. Messengers: some proteins act as hormones, which transmit signals to coordinate bodily functions. Structural component: these provide support in our bodies, for example, collagen is a protein that gives structure to our skin, bones and tendons. Transport and storage: these proteins transport different substances such as hormones, medicines, and enzymes throughout your body. Without adequate protein, our bodies can’t function. But the body is unable to store excess protein, so it’s important to consume an adequate amount every day. Between 15% and 30% of older adults are estimated to lose their appetite with aging (6). There are many changes that occur with aging that have been tied to a reduction in appetite (7). Older adults may wear dentures or have chewing difficulties which are both associated with a loss of appetite (8). Constipation is also prevalent amoung older people which can lead to prolonged satiation and a reduction in appetite (9). Medications can also alter sense of taste and smell which can reduce appetite. In fact, there are 250 commonly used drugs that alter these senses and its likely that older adults are taking at least one medication (10, 11). The body slowly loses its ability to build muscle and increase strength with age (12, 13). Studies suggest that we lose approximately 5% of muscle mass per decade, starting in your late twenties (14, 15). Anabolic resistance is the reduced ability to make muscle proteins in response to consuming a protein meal. Studies show that equal amounts of protein do not stimulate muscle protein synthesis (growth) equally in older and younger adults (16, 17). Older adults require much more than their younger counterparts to get the same muscle stimulating effect. This may occur due to a reduction in the ability to use protein or reduced blood flow to the muscles (18). But increasing protein above the recommended dietary allowance (RDA) can help decrease or slow the loss of muscle mass, especially when combined with resistance training. Disease and injury are not discriminatory, they can occur at any age. But they tend to be more prevalent among older adults (19, 20). Unfortunately, many health older adults fail to eat enough protein, but this situation is worsened when disease or injury strike. When this happens, older people tend to recover from illness more slowly, have more complications, and more frequent visits to hospitals (21, 22). Therefore, it’s important that older adults increase both their protein and calorie intake. Research shows doing so older people may experience improved bone health, heart function, wound healing, and recovery from illness (23). The current RDA for protein is 0.8 grams per kilogram of body weight, or 0.36 grams per pound (24). For example, a 150 pound (68 kg) person would need to consume 54 grams per day. But the RDA only represents the amount needed to prevent a deficiency — it says nothing about what is optimal for healthy aging. The current evidence is clear that older adults require much more protein than the current RDA to support good health, promote recovery from illness, and maintain functionality (1, 25, 26). Older adults should consume protein in the range of of 1.0 to 1.2 grams per kilogram of body weight, or 0.45 to 0.55 grams per pound (1). For a 150 pound (68kg) person this would be in the range of 68 to 82 grams of protein. Those who are hospitalized or in a critical care setting may require higher amounts of protein (1). It’s also important that calories are adequate. Consuming too few calories will result in protein being used for energy, which would further increase protein needs. There’s also research to suggest it’s best to spread your protein intake into several equal doses of 25 to 30 grams throughout the day (1, 27). If your protein goal was 75 grams, for example, it would be best to have three equally space-meals (i.e. breakfast, lunch and dinner) consisting of 25 grams of protein. The current RDA for protein is insufficient to optimize the health of older adults. Too little protein leads to an increased risk of sacropenia (muscle wasting), osteoporosis and a weakened immune system. Older adults should consume protein in the range of 1.0 to 1.2 grams per kilogram of body weight per day. This protein should be equally distributed throughout the day in 25 to 30 gram doses to optimize the beneficial effects of protein for healthy aging. Combine sufficient protein intake with resistance exercise to optimize health aging.